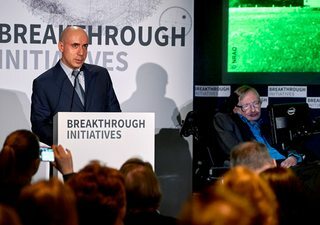 Russian billionaire and philanthropist Yuri Milner will devote 100 million dollars (92 million euros) to the SETI project, starting an ambitious ten-year project to detect signals from intelligent alien life in the Milky Way galaxy and beyond. The initiative, called Breakthrough Listen, is one of the most expensive venture ever launched in the continued hunting for alien life. The project will use two powerful telescopes — the Green Bank Telescope in West Virginia (USA) and the Parkes Telescope in Australia — to explore the nearest million stars, nearby 100 galaxies and the entire Milky Way galaxy and its billions of stars. The funds will permit astronomers to see the kinds of radar used for air traffic control from any of the closest 1,000 stars, and to detect a laser with the power output of a common 100-watt light bulb from the distance of the nearest stars, some four light-years away. Milner is also launching an open letter backing the idea of an intensified search; it has been co-signed by numerous scientists, including the famed cosmologist Stephen Hawking. said Hawking at the conference. Or do our lights wander a lifeless universe? Either way, there is no bigger question. said, Andrew Siemion ~ one of the project leaders. It’s difficult to overstate how big this is. It’s a revolution. SETI projects — the Search for Extraterrestrial Intelligence — has been mankind’s greatest attempt to search for intelligent life since its inception in 1960. SETTI project use telescope to detect interstellar radio transmissions that seem to be from an artificial source sent by beings beyond our solar system. But so far the project hasn’t had any luck finding an indication of intelligent life out there so funding for SETI has dried up over time. Now we’re getting $100 million, so that’s real progress. Russian entrepreneur Yuri Milner made his fortune through investments in Facebook, Alibaba, and many other tech start-ups and in 2012 he established the Breakthrough Prize Foundation to awards the world’s most lavish scientific prizes. Silicon Valley, with its many big-data firms and data-savvy entrepreneurs, is uniquely positioned to help with the effort. No one will count on success, but the payoff will be so colossal in recognizing that there was life elsewhere that this investment is hugely worthwhile. In the 20th century, we stepped out from our planet to space, to the moon, to the solar system. In the 21st century, we’ll find out about life at the galactic scale. It is time to open our eyes our ears and our minds to the cosmos.